When working my way down the subscription list column on the lefthand side, I noticed that at unpredictable moments the width of the column widened substantially beyond my preferred setting (which has survived countless Vienna versions). Again, screenshots to illustrate the issue. AFAICT it has nothing to do with long subscription names. It occurs at irregular moments and I've not yet been able to find anything that would explain this. When the wider width snap has occurred, I cannot drag the column to a smaller width. It snaps back when I try that. I first have to select another subscription to be able to drag the width back to its original setting. But it will occur again at some point when I continue stepping through the subscription list. Very annoying. Please fix this. 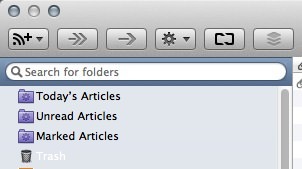 update: it happened again 5 times just now over a set of perhaps 2 dozen unread subscriptions. But if I just ignore the wider width and click the Skip Folder button again, the width snaps back to my preferred smaller setting at the next selected unread subscription. And a few items later the column suddenly widens again. confirmed, on a MBP, OS X 10.10.5. Sometimes the list column widens up to 50% of the window width. What helps temporarily is deactivating the icon set above the columns - but then again after switching through some feeds the width changes again. See also the issue at github.